Random AIR Token Airdrop event for holders within BAIBIT Exchange that hold AIR until the time of Capital Increase Airdrop Snapshot. AIR WALLET is excited to announce that they will be conducting a “Top Holder” event for our 2nd round Token Sale held on ICDM Korea Exchange. Tokens will be distributed in order, from the highest amount of AIR Tokens purchased, during our 2nd round Token Sale. 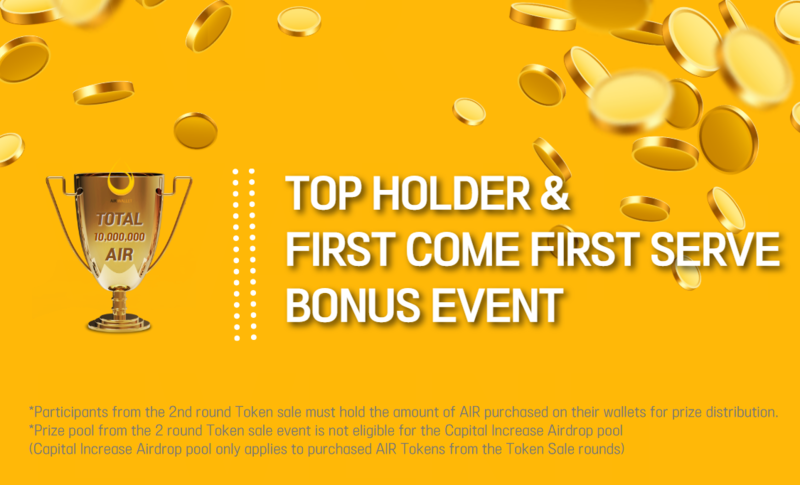 *First Come First Serve Event* For a total of 2,500,000 AIR Tokens, 25,000 AIR Tokens will be distributed to each participant for the first 100 participants that have purchased AIR Tokens during our 2nd round Token Sale.